See the platform-specific guides below, though the process is similar for each. This document corresponds to the example located online here and also to the building_and_installing_viame example folder in a VIAME installation. These instructions are designed to help build VIAME on a fresh machine. They were written for and tested on Ubuntu 16.04 Desktop version. Other Linux machines will have similar directions, but some steps (particularly the dependency install) may not be exactly identical. VIAME has also been built on: CentOS/RHEL 6+, Fedora 19+, Ubuntu 14.04+. Different Linux distributions may have different packages already installed, or may use a different package manager than apt, but on Ubuntu this should help to provide a starting point. Depending on the OS, the version of cmake you get with apt/yum/dnf is often too old to use for VIAME (you currently need at least CMake 3.11.4) so you may need to do a manual install. Go to the cmake website, https://cmake.org/download, and download the appropriate binary distribution (for Ubuntu, this would be something like cmake-3.11.4-Linux-x86_64.sh, depending on version). Alternatively, download the source code, e.g. cmake-3.11.4.tar.gz, and build the binaries from source. To untar and build the source, use the following set of commands. Keep in mind that if you’re not using version 3.11.4, you’ll need to update the version number in the below to match your downloaded version. These instructions build the source code into a working executable, installs the executable into a personal system directory, and then lets the operating system know where that directory is so it can find cmake in the future in case /usr/local/bin isn’t in your PATH variable by default. With all our dependencies installed, we need to build the environment for VIAME itself. VIAME uses git submodules rather than requiring the user to grab each repository totally separately. To prepare the environment and obtain all the necessary source code, use the following commands. Note that you can change src o whatever you want to name your VIAME source directory. Depending on which enable flags you have set and your system configuration, you may need to set additional cmake variables to point to dependency locations. An example is below for a system with CUDA, Python, and Matlab enabled. Building on Mac is very similar to Linux, minus the dependency install stage. Currently, we have only tested VIAME with OSX 10.11.5 and Clang 7.3.0, but other versions may also work. Make sure you have a C/C++ development environment set up, install git, install cmake either from the source or a using a binary installer, and lastly, follow the same Linux build instructions above. Building on windows can be very similar to Linux if using a shell like cygwin (https://www.cygwin.com/), though if not you may want to go grab the GUI ersions of CMake (https://cmake.org/) and TortoiseGit (https://tortoisegit.org/). Currently Visual Studio 2015 and some versions of 2017 are supported. First do a Git clone of the source code for VIAME. If you have TortoiseGit this involves right clicking in your folder of choice, selecting Git Clone, and then entering the URL to VIAME (https://github.com/Kitware/VIAME.git) and the location of where you want to put the downloaded source code. Next, do a git submodule update to pull down all required packages. In TortoiseGit right click on the folder you checked out the source into, move to the TortoiseGit menu section, and select Submodule Update. Next, install any required dependencies for items you want to build. If using CUDA, version 8.0 or above is desired, along with Python 3.6. Other versions have yet to be tested extensively, though may work. On Windows it can also be beneficial to use Anaconda to get multiple python packages. Boost Python (turned on by default when Python is enabled) requires Numpy and a few other dependencies. Finally, create a build folder and run the CMake GUI (https://cmake.org/runningcmake/). Point it to your source and build directories, select your compiler of choice, and setup and build flags you want. Just in case the address of submodules has changed. You only need to run this command if you get a “cannot fetch hash #hashid” error. When VIAME is built as a super-build, multiple solutions or makefiles are generated for each individual project in the super-build. These can be opened up if you want to experiment with changes in one and not rebuild the entire superbuild. VIAME places these projects in [build-directory]/build/src/* and fletch in [build-directory]/build/src/fletch-build/build/src/*. You can also run ccmake or the cmake GUI in these locations, which can let you manually change the build settings for sub-projects (say, for example, if one doesn’t build). The default Python used is 2.7 or 3.6, though other versions may work as well. It depends on your build settings, operating system, and which dependency projects are turned on. You are likely running out of memory and your C++ compiler is crashing (common on VMs with a small amount of memory). Increase the amount of memory availability to your VM or buy a better computer if not running a VM with at least 1 Gb of RAM. If you want to link against python in debug mode, you’ll have to build Python itself to enable debug libraries, as the default python distributions do not contain them. Alternatively switch to Release or RelWDebug modes. You have python installed, but not numpy. Install numpy. VIAME contains a VIAME_DISABLE_GPU_SUPPORT flag due to numerous issues relating to GPU code building. Alternatively you can debug the issue (incorrect CUDA drivers for OpenCV, Caffe, etc…), or alternatively not having your CUDA headers set to be in your include path. You have enabled CUDNN but the system is unable to locate CUDNN, as the message says. Note CUDNN is installed seperately from CUDA, they are different things. You need to set the VIAME flag CUDNN_LIBRARY to something like /usr/local/cuda/lib64/libcudnn.so. 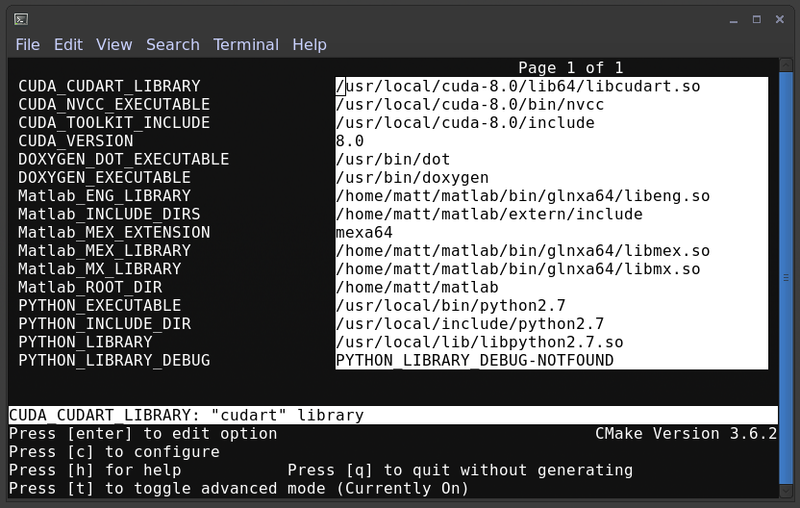 Alternatively you can set CUDNN_ROOT to /usr/local/cuda/lib64 manually if that’s where you installed it. When VIAME_ENABLE_DOC is turned on and doing a multi-threaded build, sometimes the build fails. Run make -jX multiple times, or don’t run make -jX when VIAME_ENABLE_DOCS is enabled. When PYTHON is enabled, getting the below error.